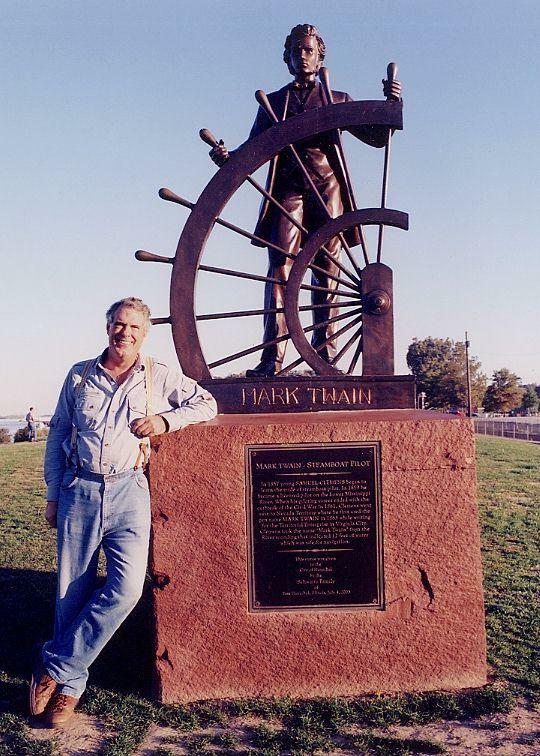 This statue was commissioned by Fred Schwartz who is a successful farmer cultivating many acres of land in Illinois just across the Mississippi from Hannibal, Missouri. 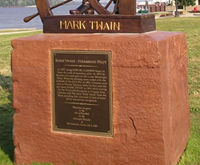 The statue was to be made by an artist in China and represent Mark Twain (Sam Clemens) as a young steamboat pilot. 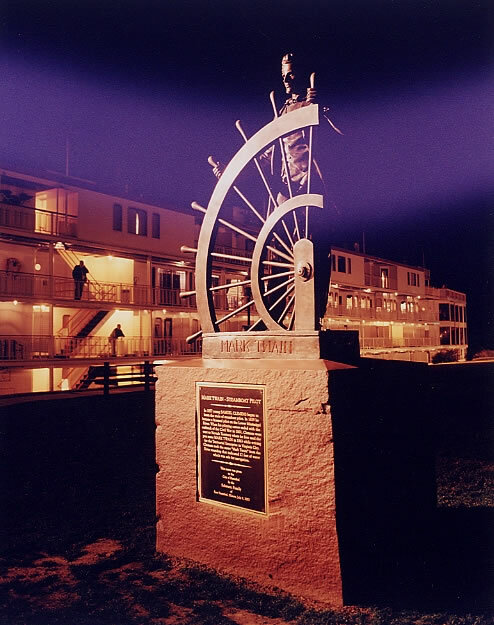 The completed bronze arrived in Hannibal in June, 2003 and was unveiled and dedicated on the 4th of July, 2003 in a riverfront park near the steamboat landing where the Delta Queen and other boats tie up and the passengers disembark. 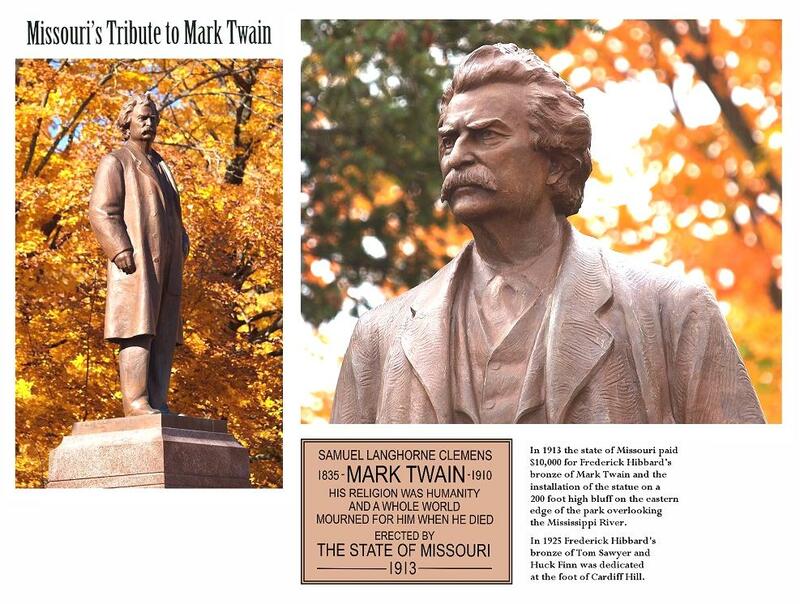 The original design proposed for the statue was derived from a photo of Mark Twain at the age of 60 in 1895. In that picture he was seated in a deck chair aboard a westbound ship crossing the Pacific Ocean during his around the world lecture tour. Twain was wearing his trademark mustache and bushy hair and a "captain's cap." I advised Fred Schwartz that Samuel Clemens should appear as he did at the age of 23 in an 1858 photograph in which he wore his hair in a fairly high pompadour style and sported "lamb chop" sideburns. I also recommended that the "captain's cap" should be eliminated from concept. The source of the style of clothing he's wearing came from the first full length photo we have of Clemens which was taken in Nevada in 1864 where he wore a low cut frock coat, a vest and high collar with necktie. The artist prettified the facial features in the statue from the actual physiognomy of the young Sam Clemens. His features had a good deal more character and closely resembled the actor Tom Berenger. 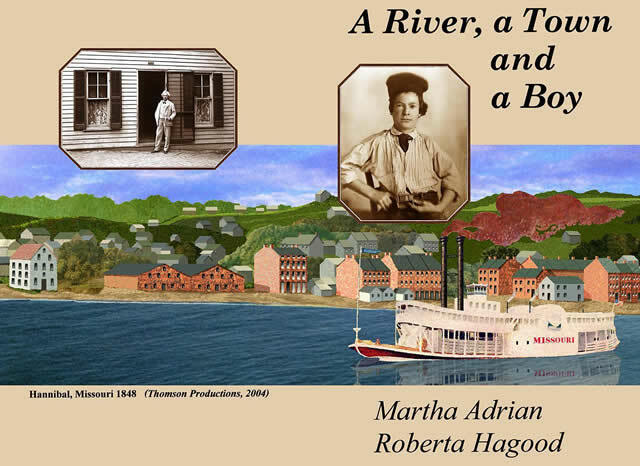 In 1857 the young SAMUEL CLEMENS began to learn the trade of steamboat pilot. 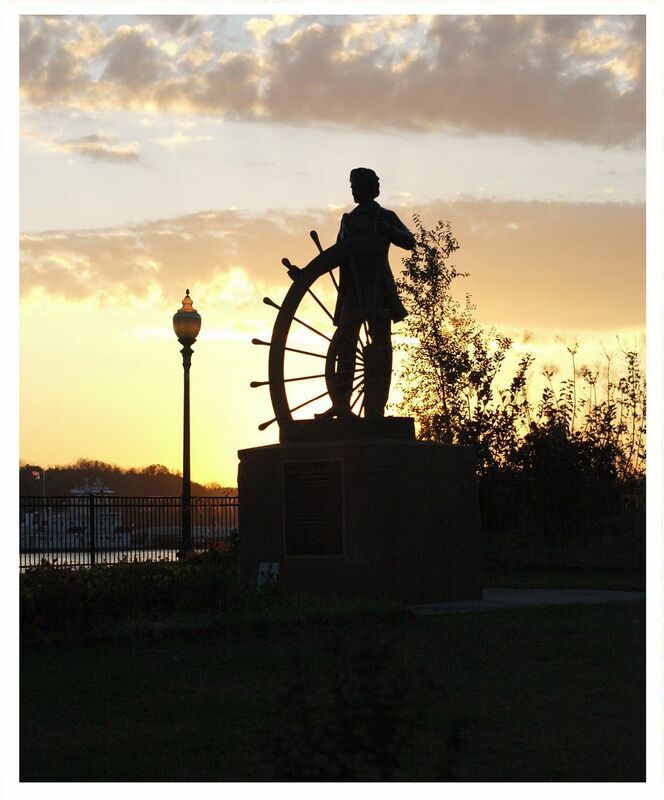 In 1859 he became a licensed pilot on the Lower Mississippi River. When his piloting career ended with the outbreak of the Civil War in 1861, Clemens went West to Nevada Territory where he first used the pen name MARK TWAIN in 1863 while writing for the Territorial Enterprise in Virginia City. 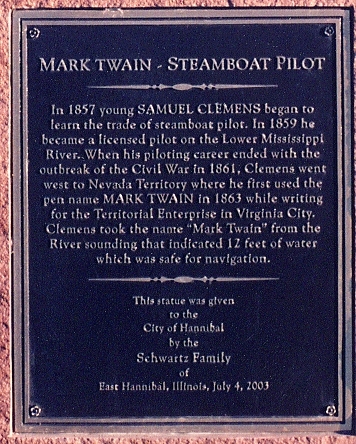 Clemens took the name "Mark Twain" from the river sounding that indicated 12 feet of water which was safe for navigation. Photo above taken at sunrise, 2010. 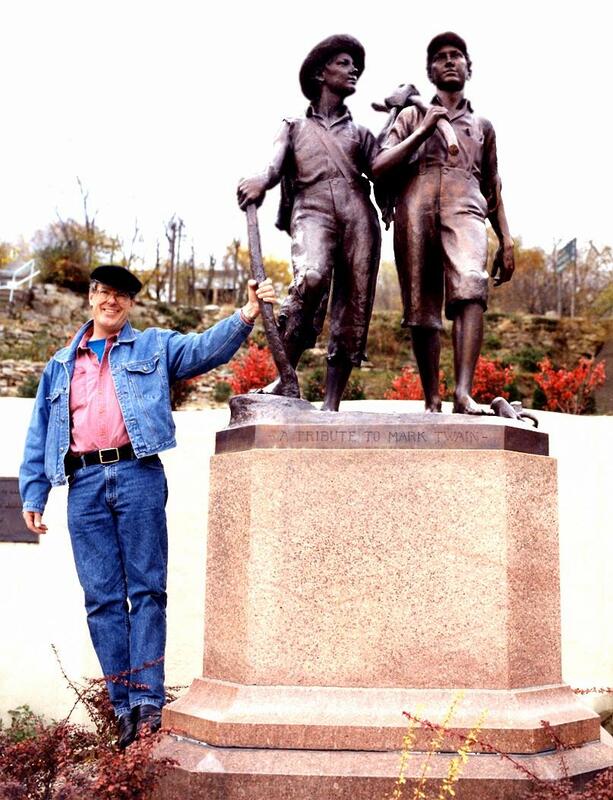 Taken in Oct 2003, 57 year old kid who never grew up, with statue that I advised the statue's donor Fred Schwartz on of Sam Clemens as a steamboat pilot, late 1850's with "pompadour" hairstyle and mutton chop sideburns. A local in town got all steamed up because he assumed Clemens had a mustache when he was a pilot but Sam didn't grow one until he was in Nevada Territory during the early 1860's. The statue is down at the landing where the steamboats land so passengers can see this "unrecognizable" Clemens that they didn't know ever looked that. Fred was mortified by the public attack of the outraged citizen who took out a page in the local paper to advocate that the statue should be removed for being inauthentic. Generous Fred lived in a beautiful home protected by the levee on the north side of the Mark Twain bridge on the Illinois side of the river. He passed on at age 80 on October 4th, 2014. Fred was a real big-hearted sweetheart of a guy who deserved more accolades instead of unfounded criticism. 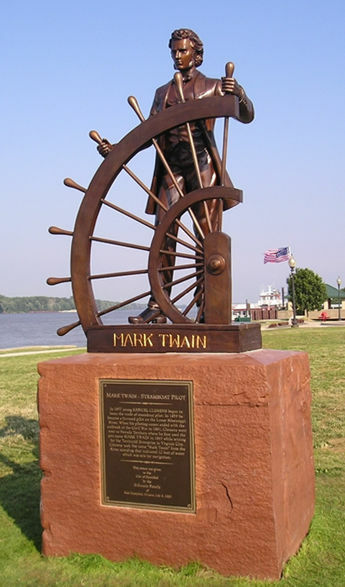 The statue was made by an artist in China which probably accounts for the "W" in TWAIN looking like and upside down "M."
I encouraged Fred to tell the sculptor to refer to photos of Tom Berenger when he was a young man bore a likeness to Sam Clemens the steamboat pilot. 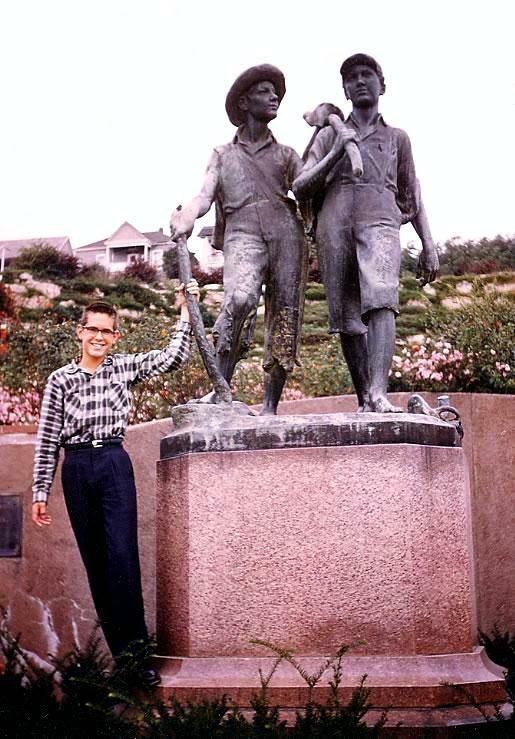 Sept 1958, 12 year old self with bronze statue of Tom and Huck at foot of Cardiff Hill. Photo redux, 34 years of wear and tear on me later, taken November, 1992.The statue by this time had been restored and looked as good as new. Composite of photos of the Mark Twain statue in Riverview Park that I had taken during several October visits, several years apart. The Hagoods had not planned to publish another book until Dave Thomson showed them his design for the dust jacket with the title "Hannibal Heritage." Upon seeing the dust jacket Hurley and Roberta resolved to go ahead with this final project which was compiled during the time that the couple both occupied the same room in the Willow Care convalescent home in Hannibal. Roberta continued working with unflagging energy to complete this collection after Hurley passed away in November 2002. 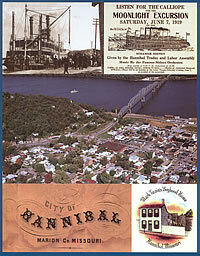 The book has been received with enthusiasm in Hannibal since its release in December of 2004 and continues to be sold in some local book stores and gift shops. 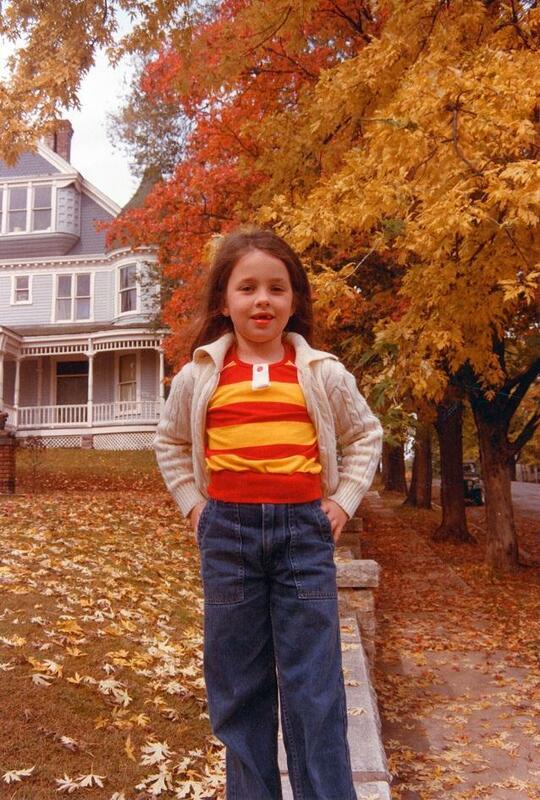 Tiffany Dickman standing on 5th Street with the Pettibone house in Hannibal where she was living in the early '80's. From the 1930's and into the '50's one of the tourism "fashions" was post cards with jumbo letters, spelling out the name of a town, city or state in "epic" style letters in perspective. The front of each letter contained familiar images associated with the town, city or state. 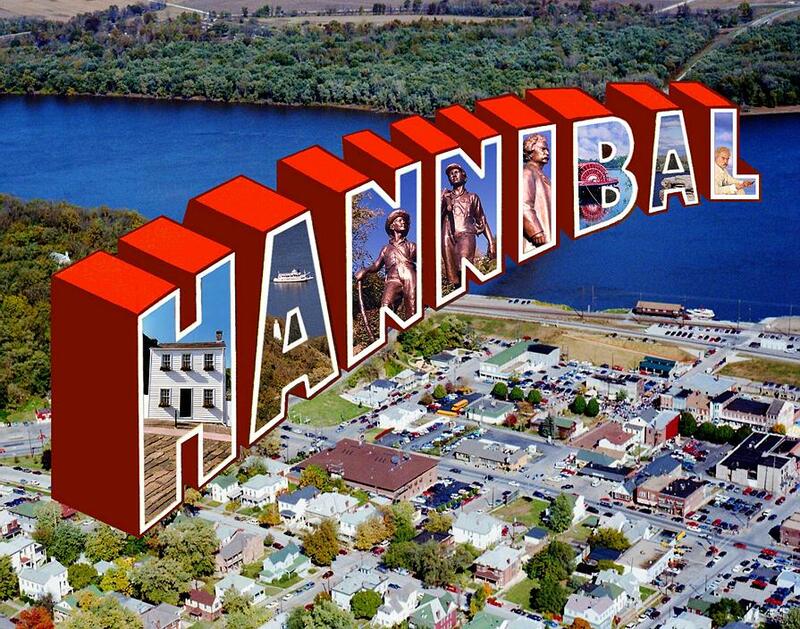 I scanned the old card of HANNIBAL, Missouri then cleaned up the sides in Photoshop and replaced all the old images with photos I had taken. In this particular composite I placed the whole thing over a detail from an aerial photo I had taken from a little single engine plane flying over Hannibal and the Mississippi River in October 1995. A - A detail from the aerial photo of the Mark Twain Memorial Lighthouse on Cardiff Hill and in the distance, the local excursion boat "Mark Twain" on the river.